Is Allie X the evil twin of Carly Rae Jepsen? The two Canadian artists both deliver fun, bubbly, frothy pop, but with Allie X there's a much darker undertone. After all, her second album 'CollXtion II' begins with a lover who'll "leave a nasty cut" and ends with True Love Is Violent. It's as if the bright pop of Jepsen has been twisted and distorted into something deliciously sinister yet romantic. Take That's So Us. At face value it's a fun little pop track riffing on a saccharine relationship - "that's so you, that's so me, that's so us". And she shows her playful side too, the way she rhymes "time" and "nine" in the pre-chorus especially. Yet this relationship is based on darkness, from the amusing "wearing black at the beach, looking pale, feeling chic" to the emo "you make me not want to die". Or take Casanova, a song about a dangerous lover. "You're a heavenly creature with a real dark agenda," she sings over pulsing dance production, the chorus repeating "Casanova fucked me over left me dying for your love" with vibrant autotuned vocals and deep bass. It's more explicit still on Old Habits Die Hard as "...the sugar turned bitter...and the summer turned to winter." The production here is more jerky and fragmented than in its previously released version, but it remains a stomping, confident pop song with an almost menacing melody. Elsewhere, the extremes have been pushed but with varied results. 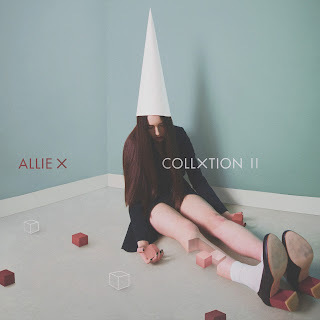 Vintage sees Allie X at her most fizzy, though it ultimately falls flat, while on Need You featuring Valley Girl she delivers an aching synthpop ballad with conversational lyrics and heartbreaking sincerity. Still, there's more experimentation here than on her previous album. While it's not totally consistent, there's still room for the reggae rhythms of Lifted, the weird synths of Simon Says, and piano ballad True Love Is Violent. Yet even at her most musically generic - Paper Love, with its wordless chorus and whistling hook - Allie X still delivers a storming contemporary track full of clever paper metaphors and origami flutters. 'CollXtion II' is a little hit and miss, but it's a pop album whose chiaroscuro brims with personality. Listen: 'CollXtion II' is out now.